The compact, lightweight and portable folding toilet using disposable bag liners. Add your BioTio compostable bags to your order. The world’s best portable toilet: chemical free, durable, lightweight and folds away to a very compact size. The no smell BioToi has specially developed BioBag liners, certified disposable in any sewage system or septic tank. BioToi meets the highest standards of hygiene, quality, function and environmental friendliness. 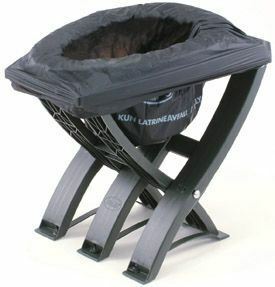 It folds up easily to transport and is chemical free which makes it extremely planet friendly. BioBag BioToi waste bags are 100% biodegradable and compostable. Each waste bag is properly certified to decompose to a humus state within 40 days when placed in a controlled compost environment, and with Heat treatment over 120°C will cause the bag to melt and decompose quickly. The BioToi waste bags are pigmented with instructions for use printed on them. You can purchase the nature waste bags alone or in combination with the BioToi. These nature waste bags fit around the entire rim of the BioToi toilet seat, making the system very hygienic and user-friendly. The bags can be tied closed and collected in a lidded bucket then composted or disposed of directly into any sewerage collection system. The BioToi waste Bag disintegrates quickly when composted in a on-site composting bin and in a on-site sewage or mains sewage systems. With heat treatment at 140℃ in floating sewage, the BioToi waste Bag will disappear rapidly. Note: if the disposal method is intended to be composted, then the addition of carbon materials can be added to the BioToi after each use as this will improve the final composting process. We recommend the use of coco peat as it is a fine material that absorbs moisture well and is easily transportable in its dry brick form. One roll of 8 bags. The no smell BioToi, specially developed BioBag liners are certified for disposal in any sewage system or septic tank and can be composted. One carton of 62 rolls. The no smell BioToi, specially developed BioBag liners are certified for disposal in any sewage system or septic tank and can be composted. A multimedia mix of organic carbon bulking materials best suited for the BioToi Camping Toilet systems.